Edited: May 18 - Malaysia participation confirmed. As was expected (I figured after the Maguro Festival they would mention something online).. for a while now actually (seems we have been discussing this for over a month now on the boards).. we finally got word about Sasuke 27. Thanks to the tireless work of Lost in Ube we have dates! SASUKE all the fans, very much Thank you for waiting. 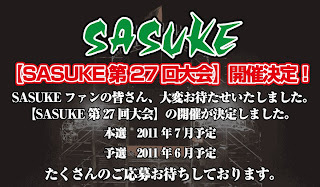 With the 27th SASUKE competition will be held. We look forward to many applicants. 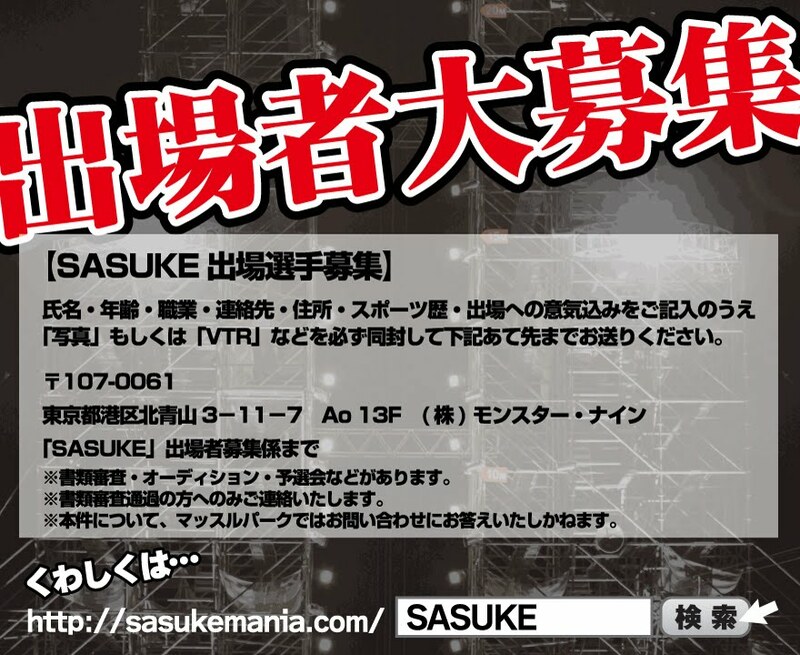 I may be incorrect.. but this has to be the first time Monster 9 has actually PRINTED a time-frame for both Sasuke Trials (Japan) AND the taping date! Right now there is no official airdate since we are 2 months out from taping. (always note with dates that far in advance - especially since this is taping - these are subject to change) When we find out I'll post it here. Maguro Festival - It is rumored that this event produced 1 winner going to Sasuke. It is not yet confirmed. Sasuke Trials - To be held in June (per this announcement). United States has 11 spots. Trials will be held May 27 and 28 for one spot on Sasuke. For those questioning what ever happened to the cancellation we are still waiting to find out. The article back in January stated that 27 was the last one. We just have to wait and see what happens. I'm hoping 27 has huge ratings so that it makes their decision to cancel a moot point. But only time will tell. Good luck to all competitors in Sasuke 27! Finally. In a way, purchasing the spot for however much and then having to pay for tickets over there is sort of redundent but people will do what they will do. I still say that was very wrong to do. Where is teh money going that is paid for the spot? Is it to help out somewhere or just slipped into a pocket of someone. At least right now there will be one more Sasuke. Yeah UK.. though this policy has been in place for about what.. a year now? Agreed Rhonda I don't like the tie in to the tragedy. Call it personal taste on that issue. As for the money in the auction - 100% of it is going to the Japanese Red Cross. We've known for a while there was a 27.. it's 28 we aren't sure about. Do we know when the show will be aired ? In july or august ? UK I've been bugging Jim North on twitter.. LOL Maybe he can provide an email for contact? Hey Mel :) There is no airdate set yet. Usually we find out soon after the taping or the same week of taping. Very seldom do we know way ahead of time what the airdate will be. Try emailing everyone. Heck.. Malaysia is getting a spot and USA has friggin' 11. Try asking Sky, Challenge, Jim. Everyone. Even if it's just one spot via video entries.. it's a start. I'll keep cheering :) Let me know if you hear anything. Btw became part of Keshiheads forums to keep up with UK news. Yeh, Hiragana!!! 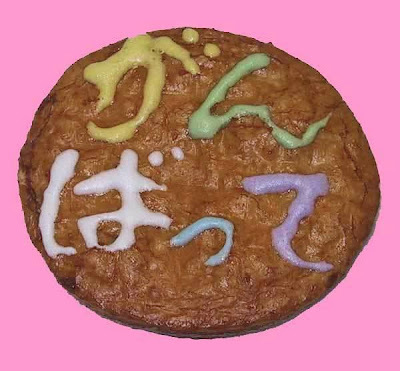 The alternative form is Gannbarou(がんばろう). Nota bene: Nagano uses this form. Hey.. wrong blog :p I just copied someone else's. Flash mob? I do know a few people with mixi accounts but I'm not familiar with the term. You'd still need permission to use the name of the show otherwise they would just say "crazy person talking crap" and omit the name of the show :p Personally TBS can do a hell of a lot more to promote it. Hopefully with Monster 9 even MENTIONING they are having trials and the show is in July is a huge start.. hopefully they have something planned to try to keep this show alive in Japan. 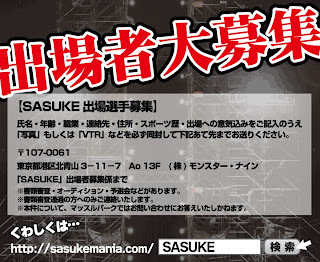 Monster 9 already put the announcement on the official Sasukemania website. TBS wouldn't put anything up unless they had an airdate with the full description of the show. They do that to every show they air. It's marketing that TBS has to do.. and they are notoriously bad at it. Well we have known for a long time that Monster 9 is only interested in Muscle Musical. Soryy I didn't know how else to contact you. Check your Email for Takeshi's Castle episodes. No worries I'll check it out. Was sick all day today. What if someone from UK traveled to japan. Then can they enter sasuke? Only if they are working or studying there. They have to have a legal residence of some kind to even be considered for the trials. Then you have to be in the country for trials. So just "going" there is not going to suffice. No problem. I wish it was easier. Trying to get Challenge to at least do some sort of contest for a spot in Japan. No dice of yet. Lets keep our fingers crossed then and also hope that the show stays on air after tournament 27 :). If you know it's unreliable.. why bother? Just ignore Wikipedia since we know it's vandalized.